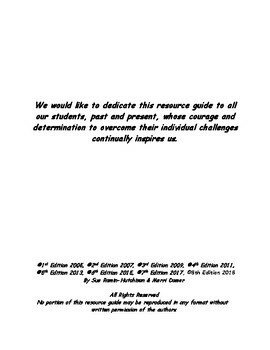 Assistive Technology, Implementation Methods & Educational Resource Recommendations for Kids with Written Output Disorders is an educational resource guide for parents and professionals working with students with educationally significant handwriting challenges. These challenges make it difficult/impossible for these students to complete their written schoolwork with paper and pencil like their classmates. The GOOD NEWS is that ALL types of written schoolwork, even advanced math and science, can now be done using the latest "best practice" assistive technology (AT)! This guide is designed to take the "guesswork" out of deciding what AT works best in the classroom for both students AND the school staff that work with them. This guide will be appropriate for students with low average to above average intelligence who have conditions such as Physical Impairments, ADD/ADHD, Developmental Coordination Disorder and Learning Disabilities - including Dyslexia and Dysgraphia. This guide contains a full continuum of assistive technology including equipment, software/apps/extensions, products, services and support for kids, K-12, with written output disorders. 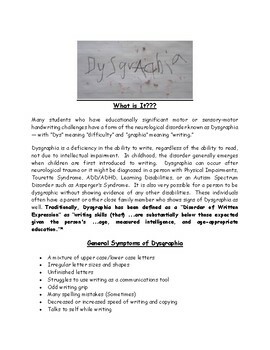 It presents the latest specific solutions ranging from how to help kids improve their handwriting skills to the introduction of equipment and software/apps/extensions when a student's handwriting is unable to be significantly improved through therapy/practice. Also included are the best classroom implementation methods - which really ARE the keys to making a smooth transition from traditional to technology-based methods for completing written schoolwork. All recommended assistive technology in our guide includes complete descriptions, website and ordering information. 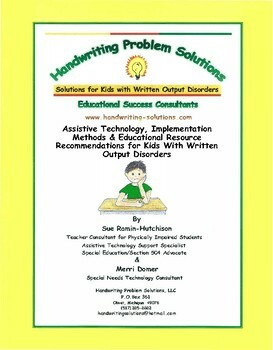 Purchasers of this guide will also have access to the Guide Updates page on the Handwriting Problem Solutions, LLC website. 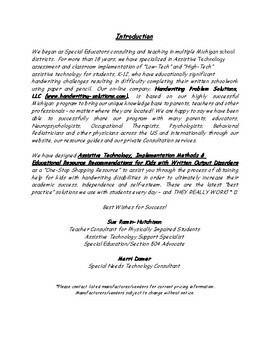 This will always keep this resource guide current and up-to-date in the future, as the authors continually post new assistive technology information for students with written output disorders on this page as it becomes available.